An acute twisting or overextension of a joint can lead to tears of muscles and tendons, called "strains," and tears of ligaments result in "sprains." These tears range from mild to severe. In mild injuries, just a few fibers are torn or stretched. Severe injuries, where there is a tear through the full thickness of the structure, are most often considered unstable injuries and frequently require surgical intervention. The intervertebral disc, a ligament between the vertebrae of the spine that works as a shock absorber, can also be torn, resulting in a disc bulge and/or herniation. In those who are training too much, overuse of a particular joint or joints in the body can result in pain and dysfunction. These injuries are called "overuse syndromes." A common overuse injury is tendinosis, also called tendinitis. In this condition, the tendon becomes inflamed from repetitive use. In the shoulder, the rotator cuff (a complex of muscles that stabilizes and moves the shoulder) becomes inflamed, resulting in rotator cuff tendinitis. Tennis elbow is another form of tendinitis that occurs along the outside of the elbow, most commonly in tennis players. In golfer's elbow, the tendons on the inside of the elbow are affected. Recent research has demonstrated that some nonsteroidal anti-inflammatory drugs may actually slow the healing process by restricting the body's natural healing mechanisms, so they should be used sparingly. 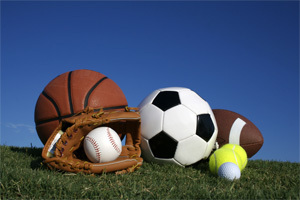 In many cases, sports injuries can be prevented. Proper conditioning and warm-up and cool-down procedures, as well as appropriate safety equipment, can substantially reduce injuries. Understanding proper techniques can also go a long way toward preventing injuries. Sufficient water intake is also an important preventive measure.